The settlement of Gokyo is located between a lake and the lateral moraine of the Ngozumpa Glacier and was no more than a summer yak pasture until several lodges were built to cater for trekkers. Gokyo Ri lies at the northern edge of Dudh Pokhari lake. It is reached by following a zig zag path up the hillside. The walk is technically very straightforward but can be pretty tough if you are still in the process of acclimatising to altitude. Just go slowly, take your time and you will enjoy it. As you climb, the summits of Everest, Lhotse and Makalu slowly come into view and from the summit of Gokyo Ri itself (5360m. 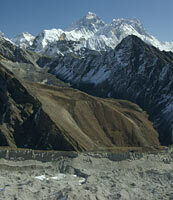 ), you have one of the finest views of Everest to be had in the Khumbu. At your feet the massive Ngozumpa Glacier (the largest glacier in Nepal) stretches from the foot of Cho Oyu, an 8200m summit to the north almost to the slopes of Cholatse. 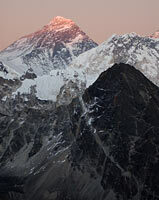 If the afternoon is clear (unfortunately it often clouds over) seize the opportunity (and a head torch) and go up Gokyo Ri to watch the sun setting on Everest and Makalu, respectively the highest and fifth highest summits in the world. This is a sight that you will not forget. Beyond Gokyo and walking north there are two more lakes and another interesting set of hills that can be climbed (or scrambled up) called Nameless Towers. These offer even more spectacular views of Cho Oyu. 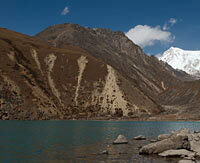 It is also really worth your while going up to the ridge of the lateral moraine just above the settlement of Gokyo. The views of the glacier are breathtaking but be very careful not to go too close to the very crumbly edge of the moraine. From the lateral moraine of the Ngozumpa glacier. The 4th Gokyo lake and above Nameless Towers. Cho Oyu is in the centre.